I really enjoyed your post Amelia, you last line made me laugh out loud, I’d be looking into the river where I just know you will be too. 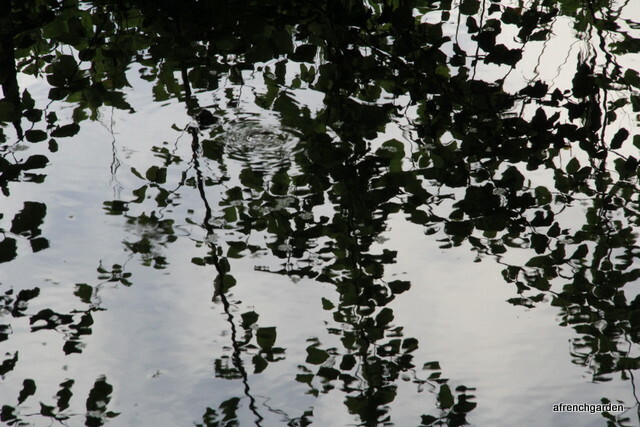 Where is the river in relation to your garden? Neat . . . and there goes your chance at having a pet turtle. I have never seen one of these either. Clever granddaughter being able to identify it. I did think it was a very strange tortoise with such a long tail. Maybe it will come back and visit. It’s wonderful to have unexpected visitors to the garden! Yes, a gateway drug, it is. You won’t believe this! By coincidence we also found one in the middle of the road, thinking it might be an escaped pet. We picked it up and sought advice from Tim and Pauline Ford. Turns out it was unknown in that particular area and a very interesting find. An expert came out from Tours, fitted it with a tracker and released it again in the same area. We were amazed at how quickly ‘Terry’ could move. Of course, as it is protected we shouldn’t have picked it up. However, doing so has led to the knowledge that it has spread to previously unknown areas. Tim, Pauline and the expert were very excited. Turns out he was male and six years old. and now… early May is when the males go “walkabout”…. 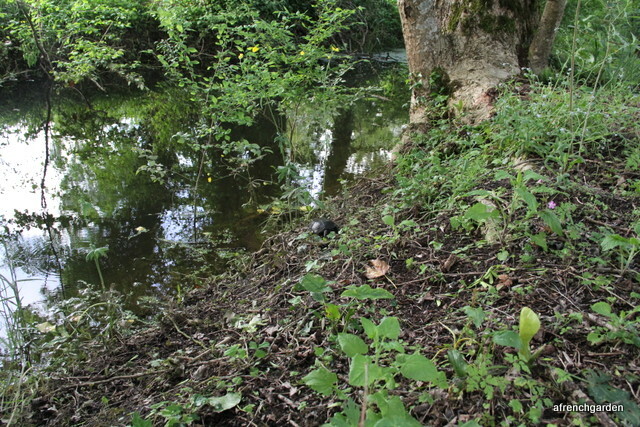 and the recent rains have helped as ditches are much wetter than normal. How do I know this….? We had the privilege to be entertained by one here a couple of days ago. the next day, as we are recorders for Faune Touraine, they brought it here. but wearing a tracking device. We hope to be able to follow its fortunes!?? 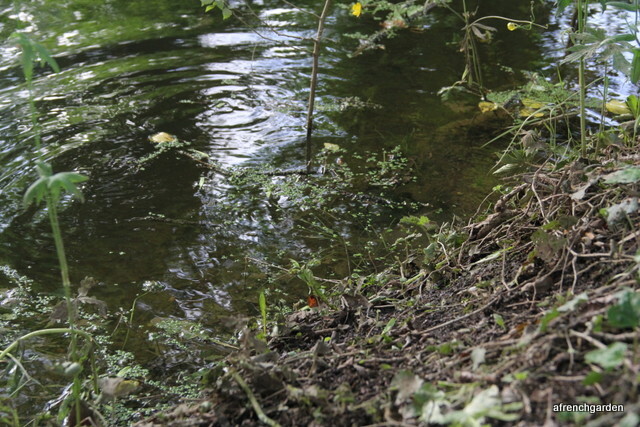 Our friends had found it five kilometres further North than any previous records…. and this one…. a six, rising seven year old male… was younger than the previous. In a very short period of time we have learnt a great deal about cistudes!! and if you have a picture that allows the rings on one of the large scales to be counted, its age can be estimated. They live up to sixty years in the wild… and over a hundred has been reported from captive specimens. So, please, register with Faune Charente-Maritime and become recorders of the wildlife in your area… you have around sixteen different groups to record… including one especially for you… hymenoptera… but not just your bees… all of the group!! We’ve only got a “boring” five to record into!! But that does include dragons and damsels… my favourites. But as you say, it is worth it! or expanding population wouldn’t be known about…. or on that bit of road… would just become part of the tarmac!! some of the qualified guides around here will quite frequently pick a wonderful flower and wave it under our noses…. What an exciting find and so unexpected! 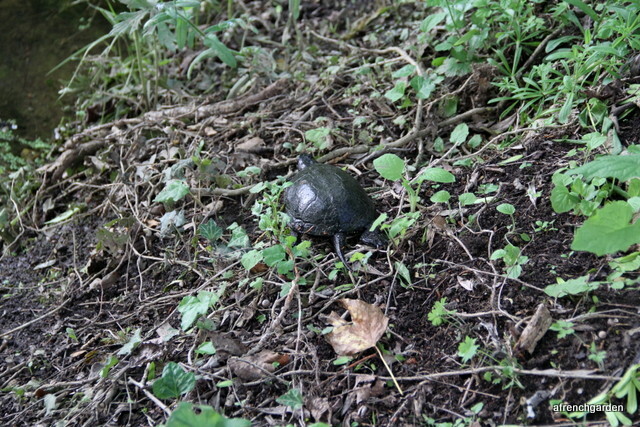 Each summer I find turtles out in the woods, quite far from any water source. I never know how they got there or what they are doing. It seems like an awful long way to go to lay their eggs. 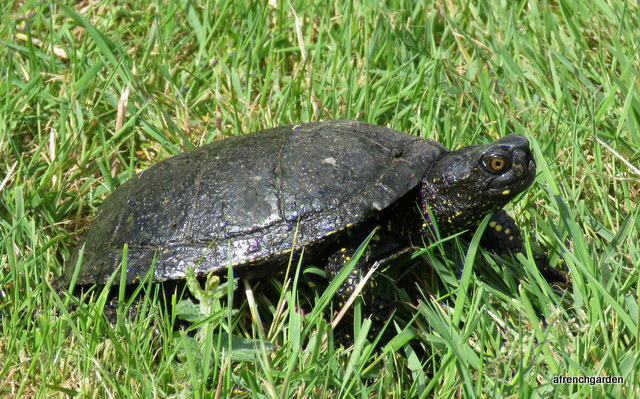 Yes, the turtles I find in the woods are the common snapping and painted turtles. 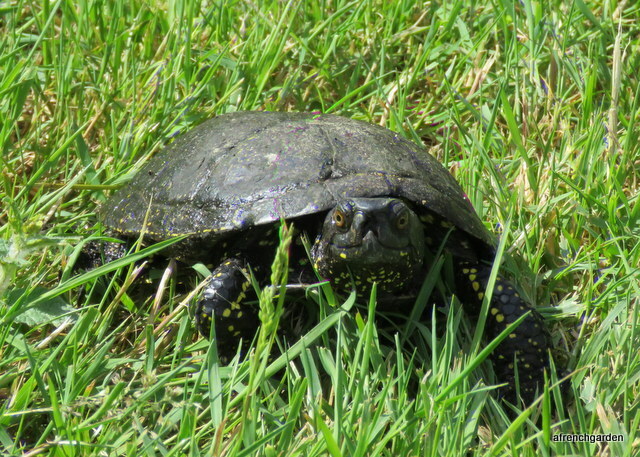 Neither is a “wood turtle.” From what I’ve read we don’t have tortoises in New England but we have many different turtles. He’s splendid, but I’m glad I didn’t meet him in my garden. 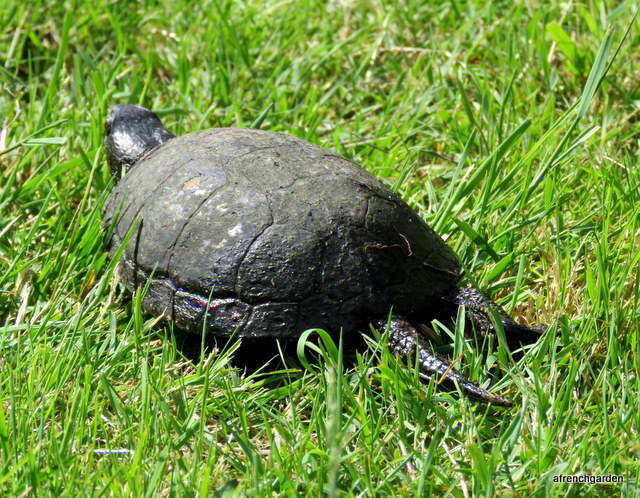 I have memories of finding snapping turtles while weeding with my granny in her Canadian garden. We were always told horrific stories about them when I was little – they can take your arm off, etc. Untrue, I’m sure, but your visitor would have had me on the run! even with an Emys it pays NOT to wiggle fingers within reach!! How exciting Amelia! I’d be over the moon if I found a fellow like that in my garden! I’ll look out for escapees in the garden!